The map to the right shows language dominance by municipality in South Africa from Wikipedia. Darker shades indicate majority, lighter shades, plurality (highest number of speakers but less than 50%). 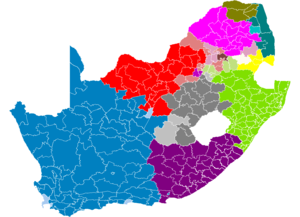 "Afrikaans in blue, Ndebele in brown, Northern Sotho in pink, Southern Sotho in grey, Swati in yellow, Tsonga in cyan, Tswana in red, Venda in olive, Xhosa in purple and Zulu in green. Borders are after the 2005 12th amendment of the constsitution. Data from the 2001 census rearranged to the new borders." (The file is licensed under a licensed under the Creative Commons Attribution ShareAlike 2.5 License. The Ministry of Education is promoting teaching and learning of the official languages. The Latin alphabet is used. For some languages, orthographies with diacritic characters were established and are still used. South Africa is the most advanced country on the continent with regard to connectivity. Independent Communications Authority of South Africa (ICASA), "created to unify the formerly separate regulation of broadcasting and telecommunications"
Universal Service and Access Agency of South Africa (USAASA) (formerly called Universal Service Agency) "is tasked with promoting 'universal access and universal service' (RSA, 2006), along with administering a Universal Service and Access Fund, through which a levy on the revenues of ICT sector licensees is aggregated and disbursed to support increased ICT access (including the under-serviced area licensees)." .za Domain Name Authority, "established under the 2002 ECT Act to 'administer and manage the .za domain name space'"
Presidential National Commission on the Information Society and Development (PNC on ISAD), "was launched in 2002 as ... a high-profile body of international IT experts invited to advise the president on ICT policy and development matters." The Global Learning Portal (GLP) has apparently had a project for providing information online to teachers in South Africa. Microsoft Corp. has indicated it will localize in South African languages. According to Tectonic (22 Feb. 2007) "the Department of Communications, CSIR and Translate.org.za have committed to updating and maintaining translations of OpenOffice.org, Mozilla Firefox and Mozilla Thunderbird for three years."